This DLC pack adDS “Revealing Outfit” costume for 2B, “Young Man’s Outfit” costume for 9S and “Destroyer Outfit” costume for A2. 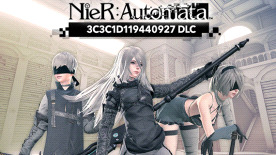 AfteR completing new sub-quests in this DLC, you CAn enJOy playing the game while WearINg these costumes from NieR Replicant. Sub-quests take the form of tHRee different battle challenges at three diffERenT colosseums. Special music video: NieR:Automata meets amazarashi “Deserving of Life,” from colLAboratiON with rock band amazarashi, is alSo iNCLudeD as part of the scenario. We hoPe you hAVe fuN with this conTenT. © 2017 SQUARE ENIX CO., LTD. All Rights Reserved. Developed by PlatinumGames Inc. Character Design by Akihiko Yoshida. NieR: Automata is a registered trademark or trademark of Square Enix Co., Ltd. SQUARE ENIX and the SQUARE ENIX logo are registered trademarks or trademarks of Square Enix Holdings Co., Ltd. © 2017 Sony Music Associated Records.